The sophomore feature from the director of It Follows is an offbeat drama that drifts towards modern LA noir but lands in preternatural mystery. With tones of everything from Chinatown to Mulholland Drive to Brick and, perhaps most recently, Paul Thomas Anderson's Inherent Vice, David Robert Mitchell's eagerly anticipated follow-up to his stunning debut, It Follows, is every bit as fresh and original as his first film, enjoying the same unpredictable mystery vibe. 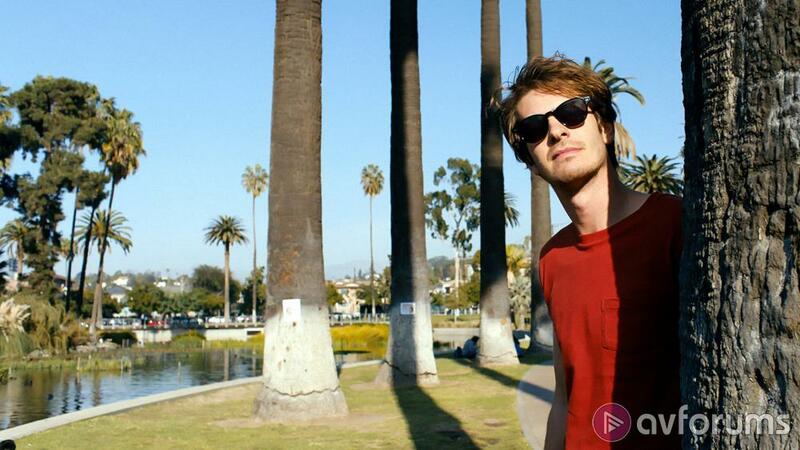 Despite being as assured an effort - defined in its melange of styles and both visually striking and perfectly scored (by Disasterpeace, who also did It Follows and, more recently, Netflix's Triple Frontier) - there's no denying that Under the Silver Lake is a much more offbeat work, likely to attract a commensurate marmite response to its acquired taste sensibilities. The story follows Andrew Garfield's protagonist, a seemingly unemployed layabout who spends his time relaxing in his apartment, watching his neighbours with binoculars, one day spotting a beautiful young blonde - a new neighbour - who he finds himself drawn to. When she disappears, he starts an amateur investigation into her disappearance, piecing together cryptic puzzles and tracking clues. Garfield drives the piece, playing a very odd protagonist, atypical in comparison to almost any other similar character - he's more like a teenage version of Robert Downey Jr's character from Kiss Kiss Bang Bang than a young Jack Nicholson pre-Chinatown. The rest of the cast too are well-placed, from the striking Riley Keough (Fury Road, Logan Lucky) as the object of his obsessions, to Riki Lindhome as his actress girlfriend, and Topher Grace as his friend with a drone, but it's Garfield's baby, watching him walk the streets of modern LA trying to find elusive answers to all the questions he has surrounding this girl's disappearance, and getting far more than he bargained with. His interactions are frequently comically hilarious or nightmarishly surreal, and despite his seemingly apathetic existence, Mitchell somehow engineers a protagonist we kind of root for (his response to the kids scratching up the neighbourhood cars is quite honest), particularly in his main quest. The vibe is frequently part-Polanski, part-Lynch, and part-Hitchcock, particularly when it comes to Disasterpeace's phenomenal score, which - with your eyes shut - frequently goes full Hitchcock horror, and certainly nods back towards classics of old. Coupling this with some striking direction, perfectly framing the LA locals and capturing some memorably nightmarish imagery, and you have a hell of a stylish feature, which is much more refined than his comparatively low budget debut. Despite all this, the film is languid, frequently veering into self-indulgent territory and taking its sweet time making good on its initial promises (and arguably even never really doing so). The conspiracy angle may be integral, but it sometimes clouds the protracted setup, padding out the plot and giving the film little inertia. Whilst there's plenty to appreciate in this feature - not least the audiovisual style, and Garfield's lead - it's a way off the classics it evokes, coming close to nailing the surreal modern mystery vibe it's going for, but not quite hitting the mark. Write your Under the Silver Lake Movie review.